The Green Man is a very ancient archetype, first appearing in prehistoric times in cultures all over the world as evidenced by numerous fertility statues and cave-paintings. His historical appearances include the Egyptian god Osiris, the Sumerian Dumuzi, the Greek Dionysius, and the Roman Bacchus. He made his first major appearance in Christian culture during the Middle Ages, when the great cathedrals dedicated to the Blessed Virgin Mary, “Notre Dame,” were being built. 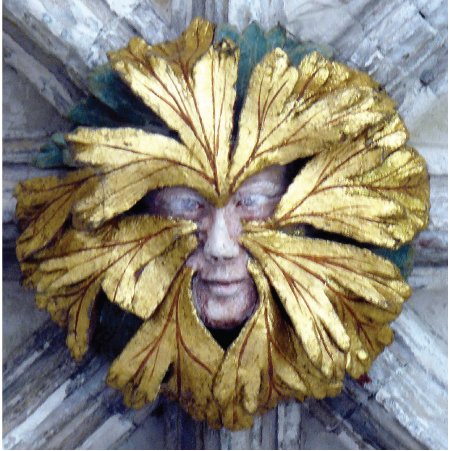 The foliate head of the Green Man can still be seen in these cathedrals, peering down from the roof bosses in the vaulting, from the tops of columns, in the choir stalls, and many other places that may be hidden or clearly seen. He is a mysterious presence, as we do not know his meaning to the medieval artists who depicted him in such diverse and fascinating ways. But the image of vegetation associated with the human head suggests that one of the symbolic meanings of the Green Man is the synthesis of Nature with human consciousness. The archetype of the Green Man appears when the Sacred Feminine arises within a culture. Once again we see renewed interest in the Green Man as awareness of the feminine also reawakens in our world today. 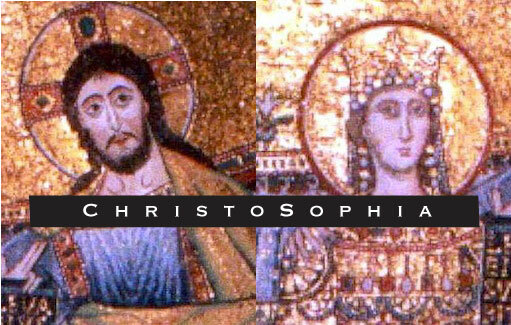 The integration of the human and natural worlds that we see in the image of the Green Man complements the union of masculine and feminine that is symbolized in ChristoSophia. The Green Man as herald of ChristoSophia is reawakening today because of our deep spiritual and ecological crisis. As surely as the sap rises in the spring, he is rising from the depths of the collective unconscious to rekindle our relatedness to the feminine and the natural world. Many images of the Green Man show him to be quietly watching the outer world through a maze of leaves with an aura of expectancy – anticipating our joining him in the awakening of the vision of the interconnectedness of all creation. Walking the Path of ChristoSophia, Chapter VII, "The Green Man"
The image of vegetation associated with the human head suggests that one of the symbolic meanings of the Green Man is the synthesis of Nature with human consciousness.